Houston Promotions mission is to provide you with the best promotional products possible. We brand your personalized artwork / business logo on custom koozies, ceramic coffee mugs, stadium cups, tumblers, tote bags, screen printed t-shirts, embroidered polo shirts, baseball caps, pens, outdoor canopies and tents, table covers, executive gifts and much more. Houston Promotions is dedicated to providing you with top quality promotional products to help ensure the success of your business or event. We are experienced and highly trained and are ready to take on your marketing needs. Whether it's a Rush, Quick Ship, 24-Hour Production Order, or an event such as a reunion, wedding, convention or seminar you're planning down the road, we're happy to assist you all along the way! Promotional products give you the most BANG for your buck when it comes to your advertising needs. Getting your information in the hands of potential customers is what it's all about, and nothing does the job better than promotional products. Studies have shown that promotional products outlast most any type of advertising, such as classified ads, radio commercials and TV spots, and have the ability of staying visible to your customers for years to come. 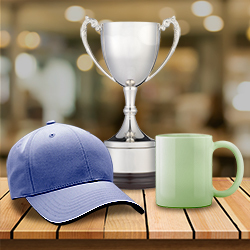 Best of all, there are 1000's of unique promotional products to choose from, and price ranges to meet any financial plan. Click here for more information: Defining Promotional Products. Whether your budget is $100 or $10,000, Houston Promotions has a vast array of promotional products for you to choose from to accommodate your needs. And... we offer Rush Services, too! Give us a call at 713-446-7987. Houston Promotions. Imprint. Promote. Impress.